Main Attractions: Waterfalls, scenic trails, beautiful views, long hikes, camping. NOTE: There seems to be every varying reports about the summit road to Everett. Their website states that the road is open up to Guilder Pond during warmer months. However, at times during summer the road is closed at the base parking. There seems to be an ongoing discussion (friction?) between reservation stewards and state park system as to how the state reservation should be accessed. As a result, some changes have taken place such as tearing down the old fire tower on top and closing all or part of the summit road most of the year (if not entirely depending upon who you talk to). It's an amazing place to hike around but you may want to call/email ahead to get the latest information (official website). It's an out of the way place so just be aware that the long drive there could lead to a closed summit road. As of this writing (July 2010) their website says the summit road is open during summer. But you should contact them first if you are traveling far just to be safe. 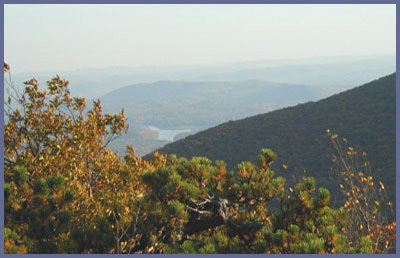 Mount Everett is located in Massachusetts close by the regional corner where Connecticut, Massachusetts, and New York meet. It's a long drive to Mount Everett from Boston, southern Connecticut, or NYC but the ride is through some of the most picturesque in Connecticut or New York state depending upon which route you decide. About 27,000 feet smaller than its Asian cousin, Mount Everest, Mount Everett requires a good amount time and energy to hike up to its 2,624 foot summit. You'll feel a mountain much bigger than the one you're standing on. The wind blows hard, the trees' growth is stunted and rugged looking, with views second to none. If you hike in from Race Brook Falls off of Route 41 in Sheffield, Massachusetts, you'll hike by one of the most picturesque waterfalls in the Berkshires (Race Brook Falls description). That would be a very tough hike for the average day hiker since the total elevation gain would be about 1,800 (trail head off Route 41 is about 800 above sea level). The old firetower is torn down so some think the views aren't work the effort via Race Brook Falls but it is peaceful at the summit and plenty of spots around the summit to piece together great views in all directions. If the summit road is open, you can cheat by driving up the mountain! There's a road nearly all the way to the top with a short walk to the peak. When the road is closed, it's a shame for those who can't hike to the summit because in that region it was the only place they could enjoy amazing views that us hikers take for granted. I've often thought how many people would love to see wonderful views but because of physical limitations they can't. It really is unfair for that reason alone that the road has been closed to the summit at various times. If you are a seasoned hiker and you want a high octane workout, you should tackle the Race Brook Falls to Mount Everett option. You'd follow the BLUE trail system (or red trail to the base of falls is fine too since it meets back up with blue trail at the top of the falls) up and beyond the falls. After the falls, the blue trail becomes a flat through a very nice forest section. The blue trail markers are hard to spot in this section but are clearly visible if you look hard enough. You shouldn't have trouble but some people lose the trail up in this section and get lost. But it should be no problem for those paying attention and eventually the blue trail meets the Appalachian Trail and its white hash marks. It's about a mile hike up the eastern face of Everett to the summit area from this trail intersection. Where the Race Brook blue trail meets the white trail of the Appalachian Trail, you'd go right (NORTH) to go to Everett. (Going left would take you south to Mount Race which also is a gorgeous spot to visit. Trail signs tell you the distances to various spots including back country campsite that are first come-first served basis.) On the eastern summit side of Everett are really nice views back into Connecticut and the Twin Lakes region. At the peak, you'll need to walk around the trails at the summit to find different overviews now that the firetower is gone but the views are grand. Don't blaze your own trails on the summit since they are trying to protect the landscape after years of folks walking all over the place. When the sky is clear you can see very far: south into Connecticut, west into New York state (the Catskill Mountain looming in the distance), north and east for a great view of the state of Massachusetts. For most people who would be up for a hike that is somewhat challenging but not a marathon, then park your car at the base of the Everett's summit road which is off of East Street in Mount Washington, Massachusetts. East Street is a high ridgeline road so you'd start your hike at a higher elevation to begin with. The summit road will take you up to Guilder Pond which has a beautiful loop trail as a side option. From Guilder Pond you continue on the road until you see the white has marks of the Appalachian Trail. Hop on the A.T. and head for the summit. From Guilder Pond to the summit is just under a mile in distance. Or just continue along the road and forego the A.T. trail option and follow the road to the old summit parking. From there, a trail to the summit still exists but it might be hard to find and follow so perhaps the A.T. to summit is the better option. From parking lot to summit should take 45 minutes to an hour, longer if you do the Guilder Pond side loop. A few rattlesnake sightings have been reported through the years. Though extremely rare to actually see one, they do inhabitat the area so it is of course worth noting to keep an eye on the trail where there are sunny outcrops or grassy areas where the cold-blooded snake sunbaths. Visit the official website for Mt. Everett for driving directions and updated info. Just note in the driving directions that Mount Washington Road that is off of Route 41 and heads up into the mountains becomes East Street at some point. Some folks become confused when they suddenly see East Street addresses but Mount Washington Road at some point high up in the hills becomes East Street. The address for Everett is 3 East Street, Mount Washington, Massachusetts but the driving directions tell you to follow Mount Washington Road all the way to Everett.